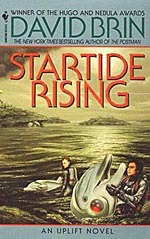 Startide Rising is the second book in David Brin's Uplift trilogy. The first is Sundiver. My review of Sundiver is here. What is the Science Fiction Premise? Startide Rising is an incredible collection of many Science Fiction ideas: faster-than-light space travel, genetic manipulation, galactic civilizations involving many different races, and much more. Most of these concepts are never discussed in great detail by themselves. They are simply borrowed from our collective kitbag of Science Fiction tropes. The one idea that is explored deeply is the concept of Uplift, the raising of one species by another to become intelligent, aware, and capable of civilization. Is the science of the premise explored? Uplift is achieved through genetic manipulation of a species to encourage the traits needed to achieve intelligence, awareness, and culture. We are not told much more than that. Clearly, it begins with a candidate species possessing the right qualifications. After that it is a matter of selective breeding and targeted interventions. Since one of the characters is a scientist who intervenes, we get a sense of the practice. Is the impact of the premise on an individual explored? Much, though not all, of Startide Rising is told from the point of view of dolphins who have been uplifted by humans. The book does a nice job of portraying how dolphin nature sometimes affects them and at other times is brought under control to serve their new status as a civilized species. Although the dolphins are accompanied by human advisors, they command a dolphin-carrying space ship on its maiden voyage. The humans and the dolphins are all keenly aware of the dolphins' status as a newly-uplifted species and the ways in which this mission reflects on their progress. We are offered many opportunities to judge that progress for ourselves. Is the impact of the premise on society explored? Humans are actually relatively new to the practice of Uplift. The galactics -- other space-faring races -- have been at it for much longer. In fact, they have a system of rules concerning the obligations of an uplifted species to the species that lifts it up. Mostly, it is a form of species servitude for a rather lengthy period. Humans are notable exceptions to the usual pattern of Uplift. For one thing, they were not uplifted by another species; they evolved to intelligence and a space-faring civilization on their own. For another, they do not seem inclined to exploit the fealty that the galactic order suggests they are owed. These two facts put humans and the uplifted species of Earth -- dolphins and chimpanzees -- at odds with most other galactic species. This conflict lies at the heart of the adventures and challenges endured in the story. I found the book quite engaging. The portrayal of dolphin behavior and motivations was especially noteworthy. Although the book often projects human concerns onto the dolphins, it also identifies situations and ways in which dolphins will think and respond differently. I will also note that the portrayal of human relationships was more interesting and subtle than was achieved in Sundiver. Suffice it to say that this time around the humans interacted in more meaningful and less standardized ways. Can I recommend the book? I enjoyed Startide Rising. It is good Science Fiction and a fun adventure. Unlike Sundiver, the Uplift premise lies at the center of almost all aspects of the book; the concept is well-explored in many different ways. Good adventure, interesting characters, and a well-explored premise, that's what I want in a Science Fiction novel. Now that Brin has found his way, I look forward to the third novel, The Uplift War.